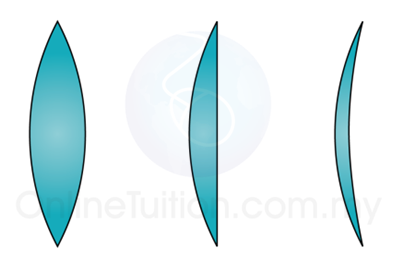 Convex lenses are thickest through the middle, concave lenses are thickest around the edge, but several variations on these basic shapes are possible, as shown in figure 1. 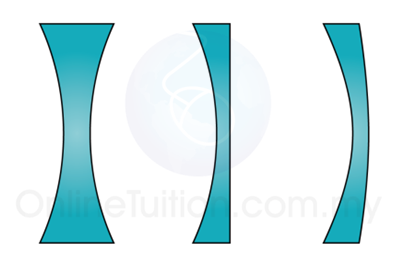 Light rays passing through a convex or converging lens are bent towards the principal axis, whereas rays passing through a concave or diverging lens are bent away from the principal axis. Optical centre, P Light passing through the central block emerges in the same direction as it arrives because the faces of this block are parallel. P marks the optical centre of the lens. Principle Axis The principle axis of a lens is the line joining the centres of of curvature of its surfaces. 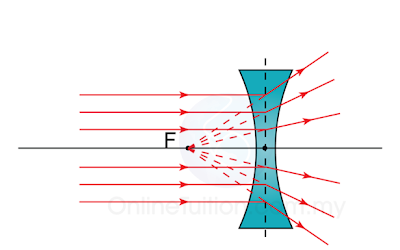 Principle focus, F The principle focus of a lens is the point on the priciple axis to which all rays originally parallel and close to the axis converge, or from which they diverge, after passing through the lens. Focal length, f The focal length of a lens is the distance between the optical centre an the principle focus. Rays of light can pass through a lens in either direction, so every lens has two principal foci, one on each side of the optical centre.